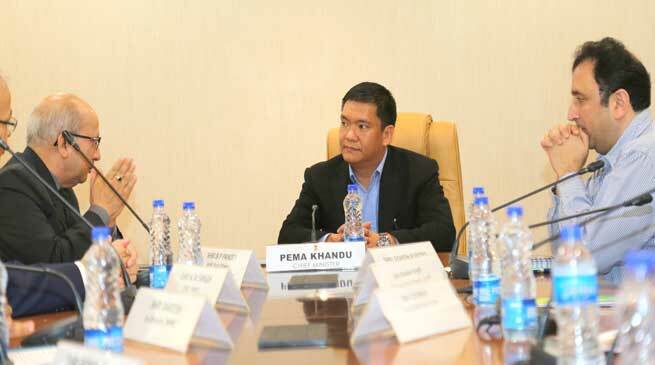 To give a boost to the hydro-power sector in the state, Chief Minister Pema Khandu held a discussion with Additional Secretary, Ministry of Power, BP Pandey along with NHPC Ltd CMD, KM Singh today here at his office. The Additional Secretary who had called on Chief Minister sought his guidance in giving fresh lease of life to the pending projects in Arunachal, informing that the centre has set the target of achieving 75000 MW by 2030. Declaring that Arunachal is a priority state for development of hydro-power sector, he informed that the centre has identified seven doable projects, which if prioritised can hugely transform the economy of the state. Also the Secretary expressed optimism that once these projects are through, investor’s confidence will get a boost in the state. The meeting discussed on the status of 2880 MW Dibang dam, Tawang Stage-I & II dams, 2000 MW Subansiri Lower dam, including NEEPCO projects. Pandey particularly pointed out the need for the Govt. of India to find acceptable solution for the stalled Subansiri Lower dam, expressing concern that Arunachal is losing about Rs 46 crore per month in terms of revenue and NHPC about Rs 1.5 crore every day for maintenance. Urging the need for the two states – Arunachal and Assam to break ice, the Secretary informed that other issues such as – relief and rehabilitation has been taken care of. The Chief Minister informed that he is in regular touch with Union Power Minister, Piyush Goyal on the issue of Subansiri Lower Dam and said that it would be sorted out politically with his Assam counterpart Sarbananda Sonowal. Also as means to resolve the issue, he suggested on increasing free power share to Assam from the current quota of 1.25%, which would be paid by the NHPC Ltd.
Khandu cautioned the dam builders that their approach must be sensitive to the local issues as much of the state’s forest resources are owned by community and have been preserved by them. Also he suggested on setting an example first by completing a project. Once the positive effect of the project on the economy starts to be felt, it could change the negative mindset of the people towards the power projects, added Khandu.